The first one is the standard version of Nendoroid Aisaka Taiga, which will include her usual angry face and grumpy expression, as well as the tiger miniature and wooden sword. She is priced at 3500 Yen and scheduled for January 2012 release. The second one is a Dengeki-exclusive version of Nendoroid Aisaka Taiga, which comes with the same parts and accessories as the standard version, along with an additional smiling face. She got the same pricing and release schedule with the standard version. Pre-order for this version will start on August 2nd. The third one is Nendoroid Aisaka Taiga: Final Episode School Uniform version, which will be sold at Chara Hobby on August 27th/28th. She will also be available for pre-order at Dengeki-ya starting on August 29th. This version of Taiga is priced at 2800 Yen. 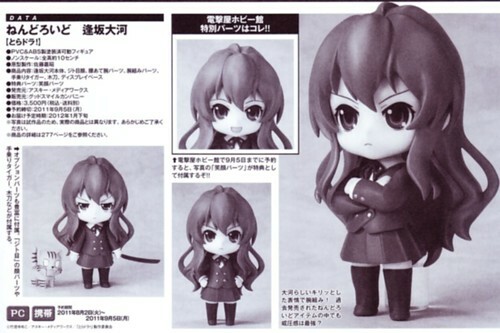 This entry was posted in News and tagged aisaka taiga, nendoroid, toradora. Guess i hav to get the Dengeki-exclusive version one since everything is the same except the smiling face one. No overdose of Taiga but overdose of Exclusive and limited edition !!! Anyway thanks for the explanations, I was so confused ! I have a question.. maybe a silly question but why buying the normal edition ? The dengeki has one extra expression ! It shows the other face expressions in the pictures for the Dengeki ver. As far as I know, yes, the Dengeki one will carry all parts and accessories from the standard run, with the additional smiling face.